As a sports fan, this is my favorite time of the year. The NFL is in full swing, the NBA is moving into the second month of the season and the UFC is sitting at the start of a two-month sprint to the end of the year. In recent years, that has meant a plethora of shows with one week off at Christmas, maybe two depending on how the calendar falls, and this year is the same, as there is an event every weekend in November, including a Friday night TUF Finale in Las Vegas that serves as the first half of a Friday-Saturday twin bill. The action starts on Pay-Per-View this weekend with the annual stop at Madison Square Garden before shifting to Denver, Buenos Aires, Beijing and back home to Las Vegas before the final month of the 2018 campaign commences. Along the way, new contenders should emerge, up-and-coming talents will get another chance to shine and the welterweight title picture could get a little more clarity as well. Here’s a look at the fights that interest me most in the month ahead. "I can’t wait to show her the new powered-up version of Roxy." - @RoxyFighter talked to us about getting another shot at fellow TUF castmember Sijara Eubanks at #UFC230. It’s funny how some people get credit for what they accomplish on The Ultimate Fighter, while others have those outings brushed aside. Eubanks falls in the latter camp, as despite an impressive run to the finals on Season 26 of the UFC’s reality TV staple, many have dismissed her standing as a flyweight contender because she’s just 4-2 overall in her professional career and sports a lone victory inside the Octagon. This weekend, Eubanks gets the chance to prove her performance on TUF was meaningful as she runs it back against Modafferi, the veteran fan favorite whom she beat in the semifinal round before missing out on her chance to challenge for the flyweight title due to issues with her weight cut. Modafferi looked outstanding in her win over Barb Honchak back in July and has been pretty solid overall during her last 10 fights since hooking up with the crew at Syndicate MMA. She’s one of the most experienced fighters on the roster and still getting better, and the winner of this one should enter 2019 in the thick of the title chase. Just 10 months after making his UFC debut, Adesanya has a chance to establish himself as a legitimate contender in the middleweight division by notching his fourth win of the year opposite Brunson this weekend. The charismatic and creative City Kickboxing representative has looked outstanding in wins over Rob Wilkinson, Marvin Vettori and Brad Tavares, and has all the makings of a future superstar, but he’s taking another step up in competition this weekend and facing his most explosive and dangerous opponent to date. 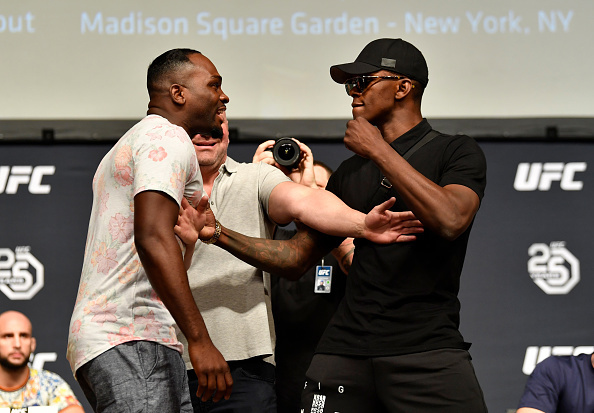 Brunson has become a permanent fixture in the Top 10 — the kind of dangerous, powerful fighter who serves as the doorman to the upper echelon in the 185-pound ranks. If you want to be considered a contender, you have to get through him and so far, the only people to beat him in the Octagon are all established members of the elite class. Can Adesanya join that group? Will Brunson turn back “The Last Stylebender” and hand him his first loss? Souza is one of those elite talents who has beaten Brunson, having done so twice, including earlier this year in his backyard in Charlotte, North Carolina. Over the last decade, the Brazilian standout and former Strikeforce champion has faced a who’s who in the 185-pound weight class with the one exception being Weidman. But an injury to Luke Rockhold has brought the two together for this weekend’s co-main event and it should be an outstanding clash of comparable styles. Weidman finally snapped his extended losing streak last summer with a victory over Kelvin Gastelum at home on Long Island, but he’s been sidelined ever since thanks to twin surgeries on his thumb. Now almost three years removed from sitting atop the division, the Serra-Longo Fight Team member remains eager to reclaim his throne and a victory over Souza could bring him one step closer. Despite his many successes, “Jacare” hasn’t been able to win “The Big One” yet in the UFC, coming up short in top contender showdowns with Yoel Romero, Robert Whittaker and Gastelum, but all of that becomes moot if he gets back into the win column with a strong performance at UFC 230. Just when we thought Cormier was done competing for 2018, Lewis pulls off the kind of comeback win only he could muster by beating Alexander Volkov in the final 15 seconds of their clash at UFC 229, drops some gems on Joe Rogan in his post-fight interview and earns himself a shot at the heavyweight title… at Madison Square Garden no less. As much as it’s fun to joke about Lewis being angry with Cormier for disrespecting Popeye’s and summarily dismissing the Houston native’s chances, don’t get it twisted: “The Black Beast” is 9-1 in his last 10 fights with seven finishes, and he brandishes the kind of power that can create instant chaos atop the heavyweight division if he lands. This is a high risk, low reward fight for Cormier, who looks to extend his unbeaten run at heavyweight to 14 and bolster his already sterling resume. While the UFC analyst and generally genial “DC” will surely have a few laughs in the lead up to this fight, understand that he is fully aware of how dangerous Lewis is and will be as ready for this one as he was for his bout against Stipe Miocic back in the summer. First and foremost, I want to say “Get well soon” to Frankie Edgar, who was supposed to face Jung here, but suffered an injury a couple weeks ago. “The Answer” is a consummate professional and always a joy to watch, so hopefully he’ll be back soon. With that said, this pairing actually intrigues me even more because Rodriguez hasn’t fought since losing to Edgar all the way back at UFC 211 in Dallas on May 13, 2017 and I’m dying to see how he responds after both a one-sided defeat and an extended time away. Jung has been sidelined even longer, having suffered a knee injury prior to his scheduled UFC 214 bout with Ricardo Lamas, leaving his comeback win against Dennis Bermudez on Super Bowl Saturday in February 2017 as his last appearance. Of course, he was returning from a two-year hiatus while completing his mandatory military service in that one and needed less than three minutes to secure the victory, so all signs point to him being good to go for this one. Will the once-hyped prospect make the most of his short-notice, main event opportunity or will the former title challenger once again return to the Octagon in impressive fashion? Calvillo had a rapid rise up the strawweight rankings in 2017, debuting in March with a win over Amanda Cooper before adding wins over Pearl Gonzalez and Joanne Calderwood to land a fight against former champ Carla Esparza at UFC 219. She dropped that fight and has been sidelined since, but she has a chance to re-introduce herself this month in a showdown with the unheralded, but dangerous Botelho in Buenos Aires. The 29-year-old Brazilian is 2-0 in the UFC and enters this contest off a thunderous stoppage win over Syuri Kondo back in May. Seconds into the fight, Botelho connected with a crushing body kick that dropped the Japanese veteran to the canvas, and after a pair of quick, precise follow-up blows, the fight was over. The landscape of the strawweight division has undergone some changes in 2018, giving Calvillo and Botelho a chance to insert themselves into the title conversation before the year is out. 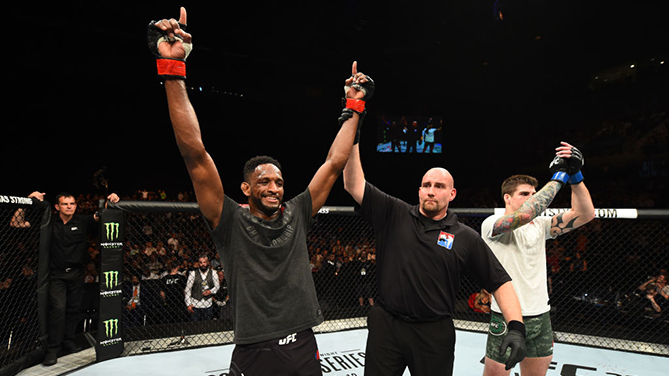 Magny is 13-3 over the last four years, including wins over Erick Silva, Kelvin Gastelum, Johny Hendricks and Carlos Condit. He’s one of the most active fighters on the roster, a permanent member of the Top 10 and one of the most underappreciated competitors in the sport today. So it was nice to see the UFC pull him from a solid pairing with Alex Oliveira earlier this fall in favor of a main event against opposite Ponzinibbio in Buenos Aires. Like Magny, Ponzinibbio has been on an impressive run as of late, collecting six straight victories to break into the Top 10 and establish himself as a tough fight for anyone in the division. The 32-year-old Argentine earned three of those six victories last year, but has been out of action since defeating Mike Perry last December in Winnipeg, but it’s unlikely he’ll exhibit any signs of ring rust with a partisan crowd at Mary Teran de Weiss Stadium cheering him on. The welterweight Top 10 is in a state of flux at the moment, which makes this one even more crucial for both fighters. To end the year with another quality victory would go a long way to setting them up for even greater opportunities once 2019 rolls around, so expect the best from each of them here. Every month when I do this piece, there is one fight that is truly flying under the radar. Saenz has won back-to-back contests and is a gritty, grinding wrestler, but I’m here for Song Yadong, the 20-year-old Chinese upstart who is already 13-2 with two No Contests in his professional career and coming off a dominant, second-round stoppage win over Felipe Arantes earlier this year. Look, there are fights this month that will have a great immediate impact on their respective divisions and much bigger names set to step into the Octagon, but if you’re letting me pick the fights I’m most looking forward (and that’s what this is), then the 20-year-old rising star who appears to have a world of potential is making the list. If he keeps improving at his current rate, the surging youngster will be knocking on the door, seeking entry into the Top 15 by the end of next year at the latest. These two heavyweight contenders are poised to meet for a second time in three years, but they land in the Beijing main event in very different places career-wise than they were the first time around. In their initial meeting, which took place on April 10, 2016 in Zagreb, Croatia, Ngannou was making his sophomore appearance in the Octagon and Blaydes was debuting on short notice, replacing Bojan Mihaljovic. Both were raw, unrefined talents and Ngannou won by stoppage at the end of the second round when Blaydes’ eye was swollen shut. This time around, Ngannou enters on a two-fight losing streak and coming off his perplexing performance against Derrick Lewis at UFC 214, where he admitted that he was still shaken from losing to Stipe Miocic earlier in the year. While still a powerhouse and boasting dangerous potential, “The Predator” has a lot to prove in this one. As for Blaydes, all he’s done since that first meeting is start training with the Elevation Fight Team crew and put together a six-fight unbeaten streak that includes back-to-back standout performances against Mark Hunt and Alistair Overeem. The 27-year-old is now longer just a bundle of raw potential, but rather a proven, established contender who could put himself in line for a title shot with another impressive outing here. Usman has been lobbying for a chance to challenge himself against the best in the division and his request has finally been heard. After pushing his UFC winning streak to eight with a unanimous decision win over Demian Maia in May, the former TUF winner now gets the opportunity to face the former lightweight champ and recent interim welterweight title challenger Dos Anjos in a main event showdown at The Palms to close out the month. Usman, who has won a dozen consecutive contests overall, has dominated with his grappling while occasionally flashing power and precision with his hands. He’s been the odd man out in the division when it comes to marquee assignments this year, but now he gets the chance to end the year with the biggest fight of his career. Dos Anjos had gone 3-0 with wins over Tarec Saffiedine, Neil Magny and Robbie Lawler after transitioning to welterweight prior to struggling against Colby Covington at UFC 215, but the former lightweight champ nearly lost his ear in the early stages of that contest and there is no telling how much that threw him off his game. The Brazilian veteran is at this best when he’s coming forward and pressuring opponents, and after being forced to let Covington lead the dance last time out, you can be sure RDA will be looking to change that here against the similarly skilled Usman.